Thanks very much for your part in inspiring my Musical Haiku. Horrid world is a reality and always full of fun and laughter is a fantasy. Only a strong heart and an united front is the hope which can ease the difficulties in life. Your Haiku’s are very strong and thought provoking. I’m sure all can easily relate to it!! Wonderful!! Wow, these are so powerful, beautiful and very deep. ‘Hope returns’ is a lovely link towards next week’s theme. Interesting haikus today, lots of hidden meanings! I’m so excited about your new house, are you going to be visiting it to take photos while construction is taking place – we did that it was so exciting (kind of sad too though!). Ooops – that last note linked to my mean-spirited stern and serious blog. It should have gone here – my fantasy land. Never mind. I’ve disabled the RSS feed. JzB who is not quite with it today. Snuck in by the skin of my teeth this week – has been a bit hectic. The emotions ebb and flow like the tide, sometimes overwhelming and crashing down, other times beautiful creations of surf and waves. 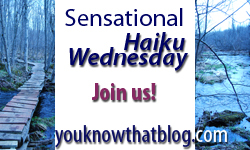 Your haiku has a certain element which is very dialectical – feeling two different, even opposing emotions, same time. Here’s to hope and next week! I went light… as snow and ice! My fantasy vacation spot for your pleasure. Sometimes (oh, probably most of the time!) our fantasies are hard to face head-on. That’s one of my take-aways from what you wrote, Jenn. I’ve just discovered your meme, Jenn. Just had to enter my link. Your haiku is inspiring. Mine has a lot of photographs as my recent visit to the Alugu caves inspired my haiku. Very powerful haiku – welcome aboard, Rosie! So happy to have you with us! i love the theme of next week. its one of my favourite things in this world- hopes and dreams. My fantasy seems to be health. I slept through most of Wednesday. Today isn’t looking any more energetic. Poor Q… *hugs* my sniffly, coughing friend. Only virtual though – I don’t want your cold!!!! “Nothing can hurt us.” I’d like your fantasy to become reality. It’s up now, Jenn. Thanks again for leaving Mr. Linky open just for me. I feel so privileged! How sweet you are! Because I can’t sleep, I’m working on my latest piece at some unearthly hour Saturday morning. It’ll be up soon. Thank you, Jenn!!!!!!!!!! Thanks for your comment on my haiku – first attempt ever. Love your meme…gets my creative juices running. Can’t wait to post on Hope for next week.